We asked Vytas Baksys (piano, ’72–’78) – who may share the record for the number of consecutive years as a camper – to reminisce about his time at Kinhaven. He is perhaps best remembered for his humorous musical contributions to the Kinhaven community, including his reenactments of piano routines by Chico Marx. Vytas also performed an infamous piano concerto for strings, oboes, and horns. Subtitled “Brr-oke,” it included allusions to Beethoven’s #3 and #7, the Beethoven Clarinet Trio op. 11, Dance of the Cuckoo (Laurel & Hardy), Schumann’s Happy Farmer, Whistle While You Work (Frank Churchill), the Fauré Requiem, Mozart #40, Dvorak #8, Mozart G minor…and a few others. “I was also lucky that about 50 percent of the faculty and staff remained the same each year,” mentioning Joe Contino (clarinet), Bob and Kay Moore (bassoon and piano), Mary Jane Metcalf and Marcia Edson (violin), Dennis Behm (horn), Dan Maki (flute), and Grace Brigham (art). Vytas said the scholarship support he received through the Annual Fund was also critically important. Vytas began his 29th season with the Boston Symphony this year, and completed his 20th season with the Rivers School Conservatory and his 19th with the Concord Chamber Music Society. He maintains a hectic schedule averaging 150 performances of 100 programs a year. Now a freshman at Brown University, Emma continues to play bassoon in a wind quintet and orchestra. Emma’s parents, Junior Session Co-directors Sandy Dennis and Marty Knieriem, have taught at Kinhaven since before she was born. “It was wonderful and supportive to have the faculty and staff watching me grow up over the years,” she says. 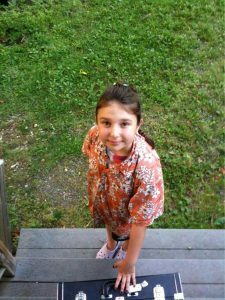 Emma didn’t like practicing when she first started on cello at age five, so they went to the Vermont Country Store and bought a Whoopee Cushion. “So I’d stand up and play a line, then sit down and make a horrible noise.” After switching from cello to trumpet, Emma moved to clarinet, and then the bassoon came into the mix, which “really vibed with my personality.” She’s been a bassoonist ever since. We are lucky to have David Buck join Kinhaven again this summer as a guest conductor in the Senior Session. We caught up with David recently to learn more about his career, his love for Kinhaven, and what he listens to in his free time. David is currently music director and conductor of the Los Angeles Symphonic Camerata, which he founded in 1997. Before that he served concurrently as music director and conductor of the Guild Opera of Los Angeles, conducting nearly 200 performances of works ranging from the Magic Flute to the Mikado. He is a professor of music at California State University, Los Angeles. [toggle title=”EXPAND for our Q&A with Conductor David Buck”]Q: You’ve worked with symphonies and operas all over the world. Where is your favorite place to perform? A: That is easy: Kinhaven! I have also enjoyed performing in New York at Avery Fisher. New York audiences are very knowledgeable and responsive. On the other hand, I watched a Berlin audience boo and throw coins on the stage during a performance of Gotterdammerung after a performer fought through a terrible cold to sing the first performance. My trips to Asia were also very special. I loved the Shanghai and Shijiazhuang (Hebei province) operas. The players were so eager to make music together! The Shanghai concert took place in what was originally a Jewish temple built in the 1920s, I believe. The concert in Shijiazhuang took place in an old Western-style concert hall that had no heat and hadn’t been renovated. One consistently bad aspect of conducting in Asia, and that includes my experiences in Taiwan, Korea, and China, was traffic. If you think New York traffic is bad, I give you Taipei, Seoul, or Shanghai for comparison. Yet I do remember an incident in when my New York taxi driver drove on the sidewalk to get me to Carnegie Hall on time! Q: You’ve been at Kinhaven for a few summers now. What keeps you coming back? A: The kids! I call them kids because I love them like they are my own children. Kinhaven is a magical place. I know this is often said by Kinhaven people. I certainly heard it from Tony and Debbie for many years before I joined the faculty. I believe this emanates from the power of music to draw all into a kind of spiritual bond. This bond lives long after leaving Kinhaven (as I have witnessed among musicians who attended decades ago). It is very rewarding for a conductor to work with musicians who give their all, especially young ones. There is the aspect of musical awakening at Kinhaven. I love to see the excitement in the faces as the kids gain control of a major orchestral work. I love seeing the camaraderie in the dining hall, in the dancing, the singing, the chamber music, the master classes. All elements of Kinhaven serve one purpose…the love of each other. That is the magic! Q: Most listened-to album (classical or otherwise)? A: I’ve spent periods of my musical life when a composer dominated my listening time, but I can’t say I have favored one above all others. I love listening to recorded music though. When we lived in Rhode Island we were given a set of very special speakers. There are only 11 in the world. Six are in the Deutsche Oper Berlin, and five in the US. Two are still ours and we listen to them habitually. They are about the size of a coffin. When we carried them to our station wagon upon taking ownership it was raining. So we covered them with sheets. Cars stopped to see the macabre scene believing that we were…well, you get the idea! One recording I will call attention to is the Toscanini performance of Schubert’s C Major Symphony No. 9, recorded with the Philadelphia Orchestra in 1941. It remains a powerful influence on me. Q: If you could only eat one meal every day for the rest of your life, what would it be? A: That is a hard one. I was raised on meat, potatoes, and gravy. But I also love apricots. So it would have to be apricot pie after a bistecca fiorentina or pasta with a fine chianti. David Buck will be returning to Kinhaven this summer. See him conduct at one of our free summer concerts! While some students attend Kinhaven with dreams of becoming professional musicians, Blair Goins (tuba ’76–’78) attended simply for the love of music. His three summers at Kinhaven were an important part of his life experience during a difficult time. “Despite some intense personal issues, I felt very connected with the faculty and to the friends I made,” he says. “The chamber music was phenomenal and the fact that you’re performing every week in front of crowds was brilliant.” Blair says those weekly student performances – their frequency and informality – helped him learn to manage his pre-concert jitters, something he finds useful today as a professional musician. Blair was still not thinking about a career in music. “I tend not to plan my life years in advance,” he says, “and sometimes it’s just weeks at a time!” So with a degree in composition with primary study on tuba, Blair taught himself music typesetting, copying handwritten scores by hand. An early adopter of typesetting software, he works with performers – among them jazz trumpeter Roy Hargrove – and organizations such as the National Symphony Orchestra and the Kennedy Center to print their music for performance and publishing. In addition to playing in various brass chamber groups, Blair is a member of the Symphony of the Potomac and the Smithsonian Jazz Masterworks Orchestra, and he is a founding member of the Great Noise Ensemble, which plays contemporary classical chamber music. “It’s like a Stravinskian orchestra, one of every instrument; there’s even a harp and a banjo,” he says. Blair is one of the group’s resident composers and says he’s fortunate to be a part of a performing group that has premiered several of his compositions. Blair recently learned he was the recipient of two Washington DC Commission on the Arts and Humanities fellowship grants, intended to further support his composing. We don’t expect every student that comes through Kinhaven to become a professional musician. Blair is a great example of how to take the lessons from Kinhaven’s camaraderie, acceptance, and intense musical experience and make it your own. Would you like to be profiled in the Kinhaven blog and newsletter? Send your contact information to news@kinhaven.org. Tito Muñoz is one of the most gifted and versatile conductors of his generation. Currently in his third year as music director of the Phoenix Symphony, he previously served as music director of the Opéra National de Lorraine and the Orchestre Symphonique et Lyrique de Nancy in France. He has also held positions with the Cleveland Orchestra, Cincinnati Symphony Orchestra, Cincinnati Chamber Orchestra and Aspen Music Festival. Committed to working with young artists, Muñoz has conducted performances at many prestigious youth orchestras, conservatory programs, and festivals, has conducted with youth orchestras and led conducting classes. An accomplished violinist, Muñoz studied at Juilliard School’s Music Advancement Program, the Manhattan School of Music Preparatory Division, and Queens College (CUNY). [toggle title=”EXPAND for our Q&A with Conductor Tito Muñoz”]Q: You’ve conducted with many university and youth orchestras. What do you like most about working with young musicians? A: My favorite thing about working with a young orchestra is that it is probably the first time most of the musicians are discovering a piece. The excitement and passion that comes from them is very inspiring. I really enjoy imparting all of the things that I’ve learned over the years from the wonderful orchestras I’ve had the privilege of leading. To see their faces and feel their excitement when the piece starts coming to life is something you usually don’t get with seasoned professional orchestras. Q: What inspired you to pursue conducting as a career? A: I began music as a violinist (including Kinhaven – Junior session 1997) and eventually gravitated toward leadership positions because I was always curious about the workings of an ensemble and taking responsibility for it. I was fascinated by what the conductor was responsible for. I remember one of my first times playing in a full orchestra, the conductor asked the timpani player to make sure his drum was tuned to the right pitch. I didn’t know that timpani could be tuned! This made me listen more to what was going on around me, and I eventually wanted to try conducting. I found opportunities in high school and in college, and eventually I successfully auditioned for the conducting program at the Aspen Music Festival, which was really the start of my career. A: Most recently it has been “Art Pepper + Eleven.” I really enjoy big band and jazz music in general. Rhythm is such an important part of my craft and aesthetic (it should be for all musicians! ), and I learn a lot about how to feel time from listening to great jazz musicians. Otherwise, I just turn on the radio and enjoy whatever might be playing. A: The chicken and rice plate (with white sauce) from the falafel truck around the corner from my apartment in Queens – a guilty pleasure, but there’s nothing like it! To learn more about Tito, visit his website, titomunoz.com. Focused on inspiring and educating young musicians, Simon Lipskar has conducted the New Jersey Youth Symphony Youth Orchestra since 2006. During summers Simon conducts at the Kinhaven Music School, where he was a student himself as a teenager. Simon received his master’s in orchestral conducting from the San Francisco Conservatory of Music, where he studied under Michael Morgan and Denis de Coteau and was awarded the conducting department award in honor of outstanding contributions to the conservatory ensembles. A graduate of Yale University with a B.A. in religious studies, Simon was a Juilliard pre-college violinist, pianist, and composer and was an award-winning chamber musician as a teenager, performing in Alice Tully Hall among other venues. Alongside his work with young orchestral musicians, Simon is president of Writers House, a leading literary agency in New York, where he represents many bestselling and award-winning authors. Q: You’ve been conductor of the New Jersey Youth Symphony Orchestra for over ten years! What is your favorite thing about working with young musicians? A: What I love most is the willingness of young musicians to join with me in fearlessly pursuing beauty, letting go of the social, personal, and psychological barriers to expressivity and discovering together that the true joy of and in music comes from abandoning all resistance to the passion and ideas of the extraordinary art we make together. Q: You were a student at Kinhaven before you came back as a conductor. What keeps you coming back? A: I love Kinhaven madly, crazily, passionately. Music at Kinhaven is not simply something to study but a fact of life. Music is the lifeblood of this beautiful community of musicians and you feel it in everything, from the committed rehearsals of chamber music, the singing that closes every day but that might spontaneously erupt at any time, the exuberant, irrepressible dancing that follows the amazing weekly faculty concerts. The simple joy that the extraordinary faculty and students share in making music together is enthralling. I consider my two weeks at Kinhaven the highlight of every year: they revitalize my faith in the importance and possibility of music. A: Oh, that’s terribly unfair! I listen to so much music, of all kinds. The best I can do is tell you which albums have been getting repeat listenings recently: Charles Mackerras’s unparalleled recording with the Vienna Philharmonic of Janacek’s the Cunning Little Vixen, Arcade Fire’s magnificent Funeral and The Suburbs, Radu Lupu’s almost too-beautiful renditions of the late Brahms piano works, Rhiannon Giddens’ devastating second solo album, Freedom Highway, Gabriel Alegria, and the Afro-Peruvian Sextet’s awesome fusion of jazz and Afro-Peruvian on Pucusana. And tons of Shostakovich, because I’ll be conducting his Tenth Symphony at Kinhaven this summer so I’m in a deep dive into all his music. 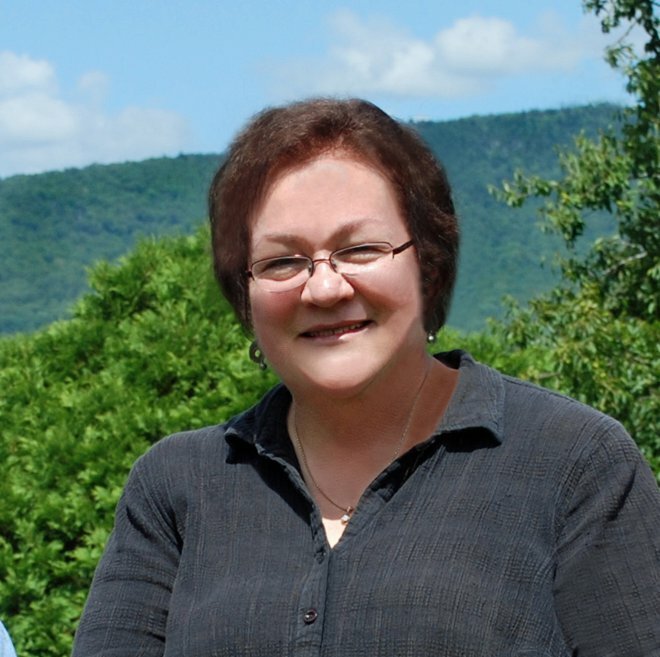 Carolyn Wahl is one of Kinhaven’s longest serving and most beloved staff, having joined the faculty in 1983. Carolyn, who has been a member of the Florida Orchestra since 1974, received her bachelor’s degree from the Baldwin-Wallace College Conservatory and has performed with the Chicago Civic Orchestra and the Buffalo Philharmonic. Her teaching experience includes St. Petersburg College, the Pinellas County Center for the Arts at Gibbs High School, the Pinellas Youth Symphony, and private instruction and coaching at high schools. We have long wanted to profile Carolyn in our newsletter. Here is what she had to say. Q: Your students say you inspire them, that you “know how to light that fire.” What inspired you to become a horn player? Carolyn Wahl: My dad was a music teacher in elementary, middle, and high school. So I grew up with it. I began on piano at age 6. 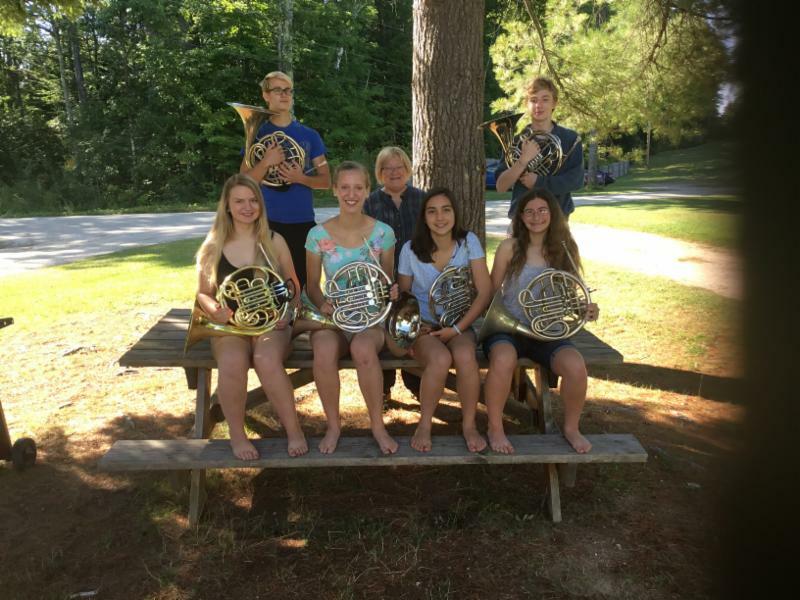 My dad would say, “What instrument do you want to try this summer?” So between sixth and seventh grades I decided to try the French horn, and that stuck. I suppose sometimes the instruments pick us. I realized that when I was still playing piano and went to a concert. Afterward, someone asked me if the pianist had inspired me. I said, “Sure,” but the truth was I was more inspired by the horn section in the back. Q: Did you like practicing? How much did you practice? Carolyn: Practicing! Well, I was always getting ready for things, so out of necessity I was practicing, and it wasn’t boring. But I wasn’t like some of my students who practiced too much, some of them six or seven hours a day! The thing about practicing is that it’s solitary. You have to be comfortable being alone in a room. But if you don’t like it, better find something else you’re passionate about. Q: If you’d known about Kinhaven as a young person, would you have attended? Why? Carolyn: I would have loved Kinhaven. The constant changing of chamber groups, playing in a woodwind quintet one week, then with the brass the next, would have appealed to me. I would have enjoyed playing in the orchestra, learning the music quickly, and a different repertoire each week. I would also have spent time in the art house learning pottery. And I would have loved the traditions, the regatta, Wally Wampus, etc. You don’t see that in other music camps. Q: This will be your thirty-fourth year at Kinhaven. How do you get ready for another summer? Carolyn: I think about what my class will look like. I’m curious to see who will come back. It’s easy to ignite kids there, especially after their first summer. One year I had this student – I knew he had something special but he just wasn’t interested. I had to get him to Kinhaven! So I introduced him to someone I thought he would think was cool – and he recruited him for me. Now he’s plays with a major orchestra. He just caught on fire at Kinhaven. It’s fun to figure kids out, to get into their heads. But sometimes you have to outsmart them a little bit! Q: Do your students ever surprise you with an insight or inspire you? Carolyn: Quite often, my conversations with students make me aware of what other teachers are telling them. I’ll try anything to get a point across. So the students will tell me something, and I’ll process it and determine whether I can use it. I also like to watch others work with my students – it gives me ideas to try. Of course I always use myself as a guinea pig! I like talking to them and hearing what they have to say – it helps me understand how they think and what’s important to them. Q: What is it about Kinhaven that keeps you coming back for more than thirty years? Carolyn: What I like are the people and the enormous respect they have for one another. Since the students are rotated in groups, competition is downplayed, which was the intent of Kinhaven’s founders. Everyone gets along and cares about one another. I like an environment where teachers are interacting in a personal way and giving all they’ve got. Since there are under 100 students, it is an intimate experience for students and staff. It is possible to really spend time helping your students and other students in the groups we coach. I’ve been going back so long that some my friendships with other faculty are very deep. And it’s a beautiful place. It’s a little like Brigadoon, a magical place that appears briefly just once a year. Q: What’s your favorite composition that features the French horn? Carolyn: I should probably say whatever I’m playing at the moment! But I love orchestral playing. Every week it’s another masterpiece. The orchestra has all the components of smaller groups, it’s all present. Sometimes, while waiting to play my part, I lose myself, surrounded by the beauty of the sound. Q: What’s your favorite Jerry Bidlack story? Carolyn: I especially enjoyed watching him with the students. I especially remember the camp meetings, where Jerry would moderate discussions of issues of concern to them. All students with something to say were listened to. It was fun to watch him guide them to come to a compromise and see each other’s points of view. Sometimes the outcome was different than even Jerry thought it would be, but he was great at finding common ground. He was also a clever poker player. We all loved playing with him on Monday and Thursday nights! I will miss Jerry at Kinhaven but his spirit will remain with us all. Learn more about Kinhaven’s faculty and staff. 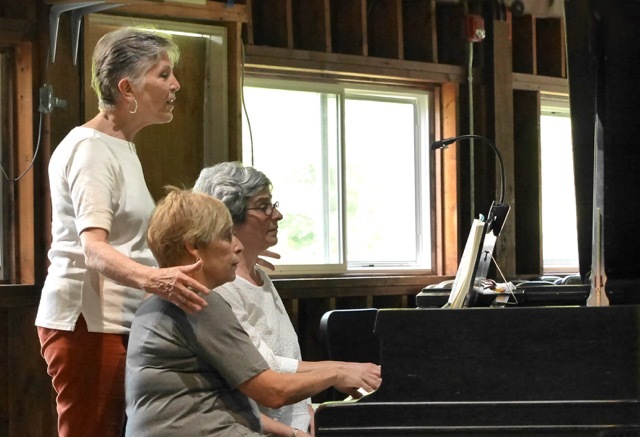 Susan Nisbett (l) and Barbara Sherman (r) perform at the Kinhaven Piano Workshop. This summer will mark Barbara and Susan’s twentieth year of playing piano four hands together at Kinhaven. During their first year at Kinhaven, Barbara and Susan played Ravel’s Mother Goose Suite. They played it again in 2013, switching parts. 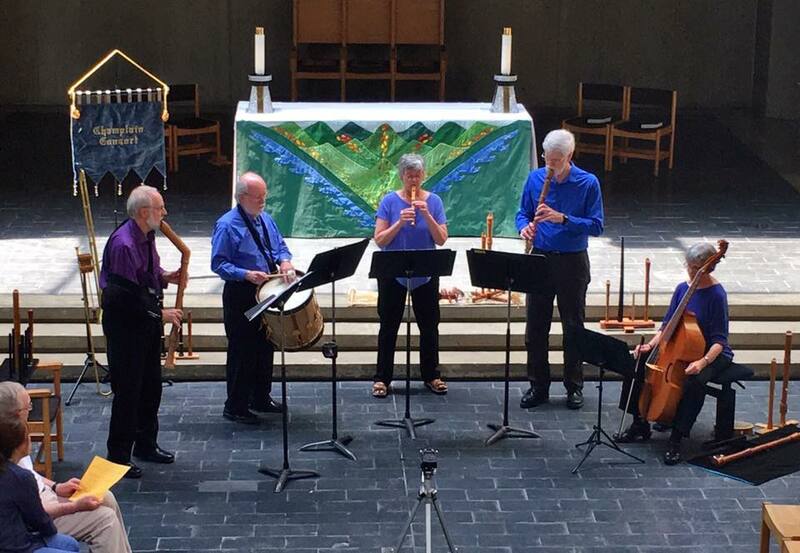 “It’s exalting music,” says Susan, “you want to cry at the end of your own performance.” One of their most vivid memories from that first year was the copious rain, which, as they remember, was of biblical proportions. “The ground began to swell and heave, and springs began to sprout up,” Susan recalls. Cold and soaked to the bone, almost all the faculty and students trekked to the Vermont Country Store to buy identical yellow raincoats and shoes. 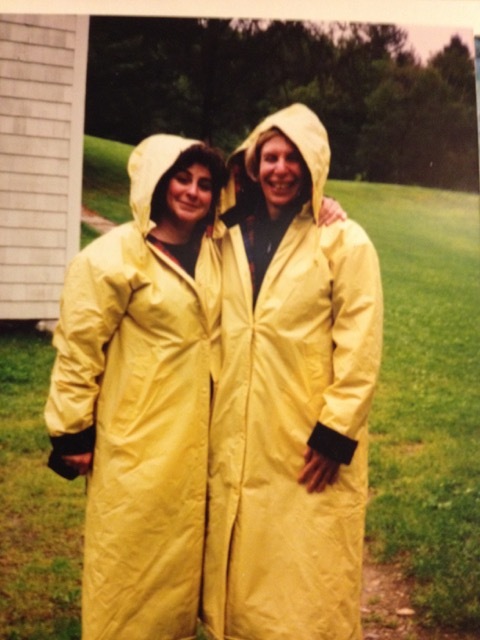 Barbara Sherman (l) and Susan Nisbett (r) at Kinhaven in 1998, the year of epic rain. Piano teacher Nancy Breth coaches Susan and Barbara as they prepare the Andante from Schubert’s Grand Duo. They also look forward to the intensity of the one-week workshop. They recall working on the slow movement of a Schubert sonata one year. “We did come prepared, but then we started digging in to the music, and one evening we worked and worked and worked, talking through the most minute issues,” says Susan. “It was miraculous,” Barbara agrees. Learn more about Kinhaven’s Adult Piano Workshop.